The effects of Gwanjul-go, one of the best prescriptions for arthritis offered at Jaseng, have been validated scientifically by joint research with Kyung-Hee University. The main ingredients of Gwanjul-go inhibit MMP3, an enzyme known to damage cartilage. Ginseng, an ingredient in Gwanjul-go, was found to be especially effective for pain control, cartilage protection, and cartilage regeneration. 50% decrease in MMP3, a cartilage degenerating enzyme, after administration of Gwanjul-go. Gwanjul-go has been proven to prevent collagen decomposition and to boost collagen formation. It also modulates signals to inhibit cartilage cell apoptosis, or cartilage cell death. 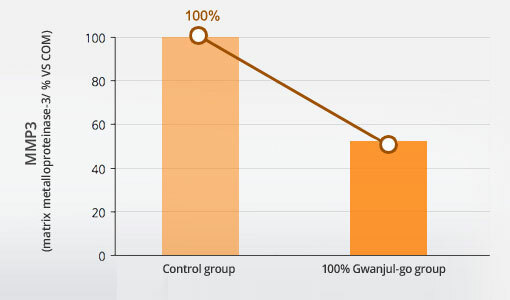 Gwanjul-go has been proven to prevent collagen decomposition and to boost collagen formation. It also modulates signals to inhibit cartilage cell apoptosis.